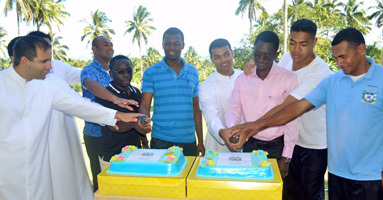 Benedict D'souza (NZ), Guy Asogoma (Africa), Leonard Safeh (Africa), Mikaele Misinale (Oceania), Nikolai Reimers (Europe), Pio Ravu (Oceania), Samuela Tukidia (Oceania), Soane Hehea (Oceania), Stev Youm (Africa) and Viliami Kiola (Oceania) / Novice Master, Fr Kevin Conroy, with Marist Lay friends. 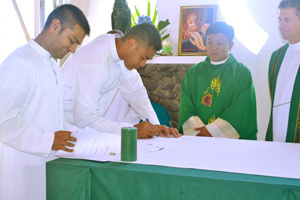 "It was a memorable occasion, the climax of what is the first novitiate to be held at the semi-rural property at Eden, Davao in the Philippines. The liturgy included beautiful music led by the now newly professed Marists and assisted by the 10 novices-elect. Fr Lauro Arcede (Asia) presided and Fr Martin McAnaney (Europe) received the vows on behalf of the Superior General and gave the homily. 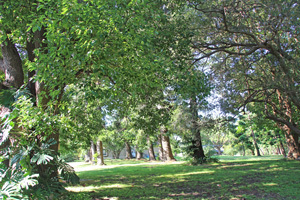 The weather was perfect and the property was looking its best for the occasion. 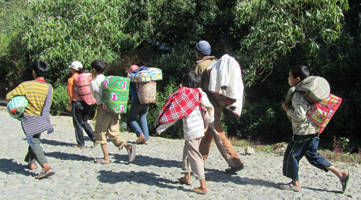 The 150 people who were present represented all branches of the Marist family and lay people and religious who have assisted in some way with the journey of the novices. Fr Fernando Ingente has now taken up the role as novice master for the next novitiate and I have shifted to being his socius. 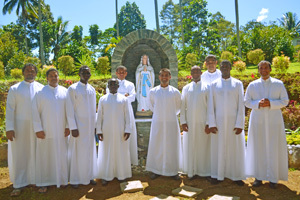 The novices-elect have already moved to the novitiate and will begin their novitiate on Feb 01." Australian Marist JPICC member, Fr Jim Carty SM, is one of Sydney Alliance's advocates to support the recent statement by NSW premier, Mike Baird, on a new deal for refugees and asylum seekers. Click here for the Sydney Alliance statement. 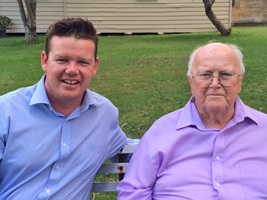 Plans are being explored for a play based on the life of Marist missionary, Fr Tony Glynn, which would draw on the books already written about him by his brother, Fr Paul Glynn (pictured, left) and Mr Jim Briggenshaw. 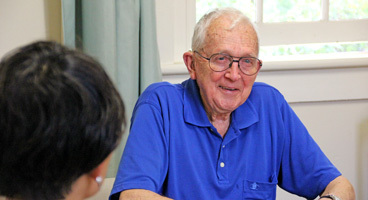 Members of the writing, acting and production team visited Fr Paul at Hunters Hill on Jan 28 to consider themes, A major focus could be on Fr Tony's outstanding moves towards post-war reconciliation between Australia and Japan. 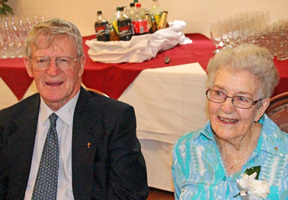 Veteran Marist missioner, Fr John Hill SM, is moving from 'Montbel', Hunters Hill, to St Catherine's Aged Care Facility, fifteen minutes away at Eastwood, NSW. 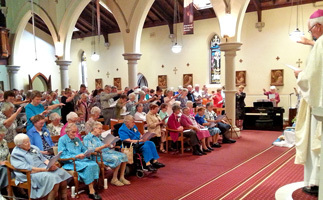 Confrères from local Marist communities gathered on Jan 26 to farewell Fr John. He will return to Montbel on Sundays for Mass and lunch as well as the monthly Japanese Mass at Hunters Hill. 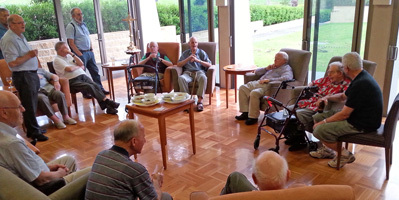 Fr John expects to lead an active social life in his new sourroundings at St Catherine's. Enjoy your new digs, Fr John! 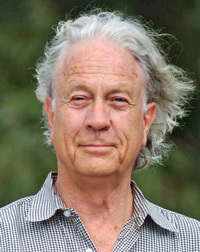 Indigenous rights advocate and 'Australian of the Year' nominee, Professor Henry Reynolds, asks where should we begin if we were to rethink our national day. 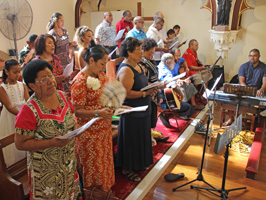 The Fijian Catholic community of Sydney hosted an impressive Eucharistic welcome for the visiting Archbishop of Suva, Most Rev Peter Loy Chong, in a packed Holy Name of Mary church, Hunters Hill, on Jan 25. Civic and denominational representatives attended the ceremony which was rich in music and culture. With extensive experience and team work in Worldwide Marriage Encounter, Archbishop Peter will soon travel to Melbourne to celebrate Mass during the international meeting of WWME. Meanwhile, welcome to Sydney, Archbishop Peter! 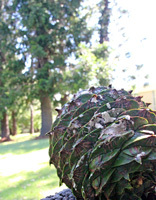 Marists of the Villa Maria community, Hunters Hill, NSW, are at risk from the seasonal falling of giant cones from the monastery's grove of majestic bunya pines. 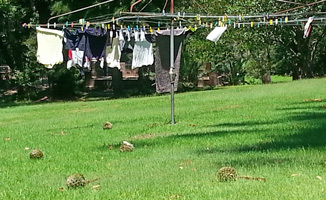 Dozens of the watermelon-sized cones are dropping each week a few metres from the community clothes line. 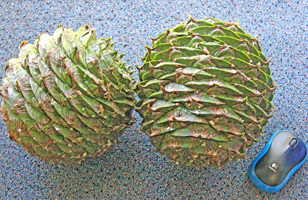 Bunya cones can weigh up to 10 Kg.Trespassers, thieves and wanderers be warned! 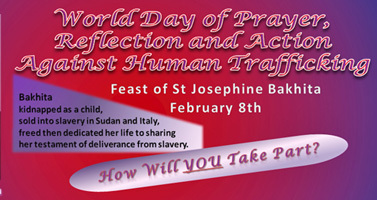 The feast day of Sudanese anti-trafficking patron, St Josephine Bakhita, has been chosen by Pope Francis as a day of prayer, reflection and action against human trafficking. 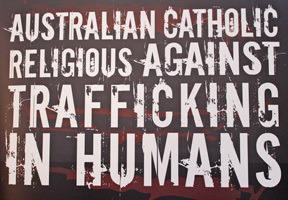 Australian Marist Sister, Noelene Simmons SM, has made available information about the Feb 08 occasion from her desk at ACRATH (Australian Catholic Religious against Trafficking in Humans). 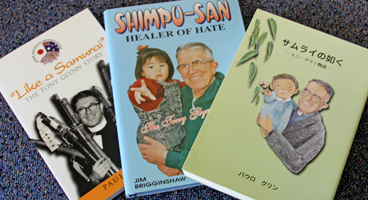 Click here for ACRATH and its resources and more about St Josephine Bakhita and Pope Francis' message..
Three Australian Marists recently recalled the fifty years since their entry into the Marist formation program in 1965 at Toongabbie, NSW. Celebrating over relaxed days at Currumbin, Qld, were Frs Kevin Bates, John Worthington and Michael Whelan and former colleague, John Palmer. 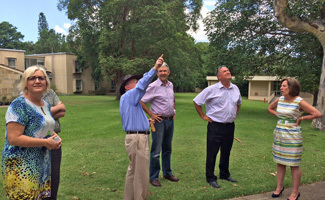 Leaders of Marist-founded schools in Australia met at Hunters Hill on Jan 16 with members of the Marist Charism and Culture Committee. 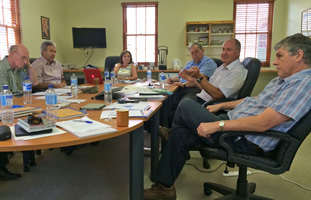 The group focussed on programs for staff and students to assist Marist charism and culture being deepened and encouraged in Marist-founded schools. The pastoral team of Sydney's historic downtown shrine of St Patrick's met at Hunters Hill on Jan 13 to review and plan their ministry for another year. 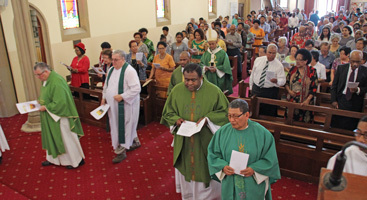 St Pat's is a part of an international network of Marist city centre churches. The group led by parish priest, Fr Ray Chapman SM, was addressed by Marist provincial, Fr Bob Barber, who reminded the group of its significance in the worldwide network. In celebrations at North Sydney on Jan 12 for diamond jubilee of religious profession, links between the Josephite Sisters and the Marist Fathers were evident. Amongst the jubilarians were Sr Mary Harding RSJ (sister of Fr Jim Harding SM) and Sr Guiseppe Walsh RSJ (sister of the late Fr Maurice Walsh SM). 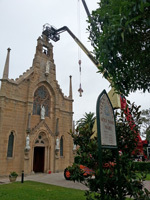 Historically there are close ties between Australia's first saint, Mary of the Cross MacKillop, and the early Marists of Hunters Hill. 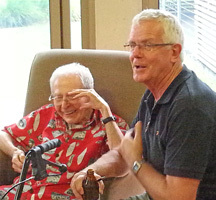 As well, Josephite co-founder Fr Julian Tennison-Woods, spent time with the Marists in France and would stay with the Villa Maria Marists when in Sydney. Above: Arms were raised in blessing over the diamond jubilarians at the Eucharist led by Bishop Peter Ingham (far right). Three other bishops and ten priests were also present. The Mass was held in the chapel of St Mary of the Cross MacKillop at North Sydney, NSW, where the Saint is entombed. | Marist publication, 'Harvest', was one of the first to publically promote the Beatification Cause of Mary MacKillop in the 1970s. 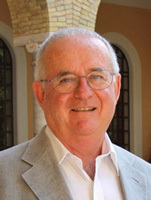 As reported in our Sep 2014 news, Australian Marist, Fr Tony Corcoran, has been appointed for a third consecutive term as Secretary-General of the Society of Mary. Fr Tony's renewed term commenced on New Year's Day. He continues as Procurator to the Holy See and local superior of the General House in Rome. 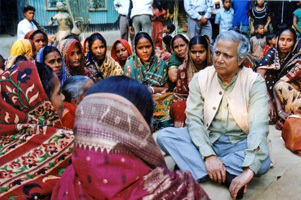 This month's anniversaries include the first loans from the Grameen Bank (1977) and Pope Gregory XVI's entrustment of the Oceania missions to the Society of Mary. 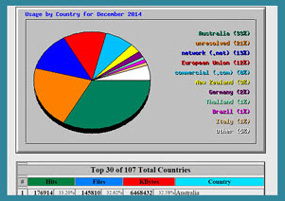 On Dec 29 daily visits peaked at 893 with a monthly record of over 500,000 'hits'. Visits came from 107 countries, leading visitors (after Australia) being European Union, NZ, Germany, Thailand, Brazil, Italy, Fiji and Ireland. 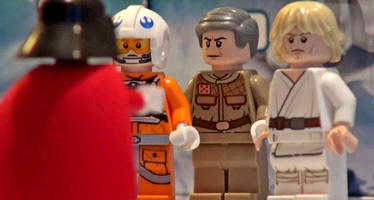 The site is anticipating its customary January-February visitor slump. Phew! 'Icing on the cake' for Holy Name of Mary church's stonework restoration came in the form of a handsome new cross fitted in the closing days of December. 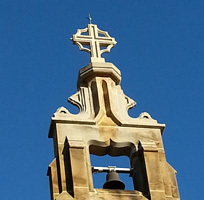 Sandstone for the cross was excavated in Sydney's Rocks area and is reputed to be amongst the finest in Australia. 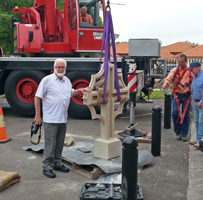 Hunters Hill parish priest, Fr Kevin Bates SM, is pictured below on the day of the cross's final placement. 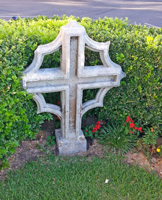 Also pictured (far right) the original cross now resting peacefully in front of the church. 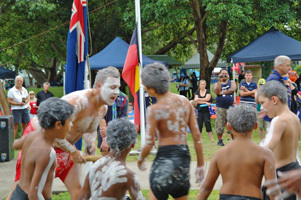 Educational, cultural and spiritual resources have been collated to respond to the new schools’ curriculum and the needs of the Aboriginal Catholic and wider diocesan communities. 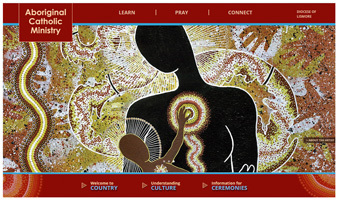 Special features include: Understanding Culture, Spirituality, prayers and ceremonies, Calendar of significant events, Aboriginal Leaders and role models, Links to key resources and contacts, ‘Welcome to Country’ and ‘Acknowledgement of Traditional Custodians’, Principles of Catholic Social Teaching - these explore concepts like dignity of the person, option for the poor, justice, rights and common good, Current issues, Arts, drama and stories.